You might not think of cranberries as a category for innovation. After all, it’s a superfruit that should be eaten often. Decas Cranberry Products, a third-generation family business located in the heart of Massachusetts’ cranberry country, wants to help. Its products are available at retail under the Paradise Meadow brand: a line of all natural, non-GMO, sustainably-farmed cranberries. 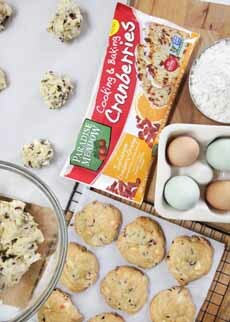 In the latter category are the new Julienne Cranberry-Orange Cooking & Baking Cranberries (photo #1), available at grocers nationwide. They’re julienned—chopped—to better distribute the flavor when you cook or garnish with cranberries. All Paradise Meadow products can be added to oatmeal and other breakfast cereal, green salads, protein salads (chicken, egg, etc. ), trail mix, stuffing, and meat and poultry dishes. They can be baked into breads, muffins, cookies, and pies like cranberry-raisin pie and pecan-cranberry pie. Just add them to your favorite recipe. Use them as garnishes on sweet and savory dishes. Add them to rum raisin ice cream (recipe). Combine them with the raisins, or eliminate the raisins entirely. Here’s the history of cranberries, which had been harvested wild for some 12,000 years by Native Americans, from the Wampanoag People of what is now Massachusetts, south to the Leni-Lenape of New Jersey and west to the Algonquins of Wisconsin. The first cultivation of cranberries took place in Dennis, on Cape Cod, around 1816. 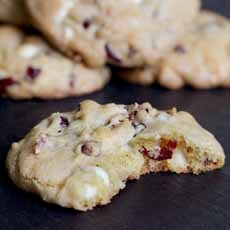 One heavenly cookie, made with Paradise Meadow Julienne Cranberry-Orange Cooking & Baking Cranberries and white chocolate chips. Photos courtesy Paradise Meadow. When we previewed the cranberries at a recent trade event, the same time, we tasted one of the best cookies we’ve had in recent memory (recipe below). The combination of cranberry, orange and white chocolate, and the chewy texture, is simply…divine. You will be a cookie hero, or the best guest, when you bring a batch to work or to a party or get-together. Many thanks to Paradise Meadow for the recipe. 1. PREHEAT the oven to 375°F. Line cookie sheets with parchment paper and set aside. 2. BLEND the flour, salt and baking soda together and set aside. 3. CREAM the butter with an electric mixer. Add the sugars and beat until light and fluffy. Add the vanilla and egg and beat well. 4. SLOWLY ADD the flour to the sugar mixture and blend. Stir in the cranberries and white chocolate chips. 5. DROP by rounded teaspoon onto prepared cookie sheets. Leave space between each cookie as they will spread while baking. Bake 8-10 minutes and cool on cookie sheets.